Revolutionary perimeter injection technology design provides better nitrous and fuel atomization! For years, plate systems have been just that; a plate bolted under the carburetor equipped with two crude brass spray bars to inject nitrous and fuel into the intake charge. Nitrous technology is getting ready to take a huge leap forward! The new ZEX Perimeter Plate nitrous system provides the optimum spray efficiency with nitrous and fuel outlets placed at 12 injection points around the perimeter of the intake manifold. This new system provides perfect distribution of nitrous oxide and fuel, delivering the most horsepower possible. Through an ingenious new design, nitrous is injected into and through the ZEX plate creating a highly combustible nitrous and fuel cloud in the plenum of the manifold. This even distribution avoids the irregular fuel burn problems and leakage found with spray bar systems, which results in lost power. 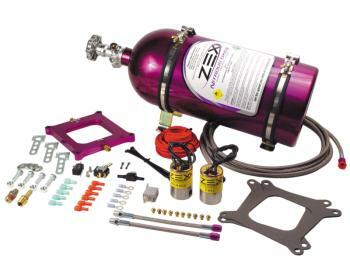 The new ZEX Perimeter Plate nitrous system is tunable for a 100 to 300 horsepower boost and is compatible with any square flange, four-barrel carburetor application.